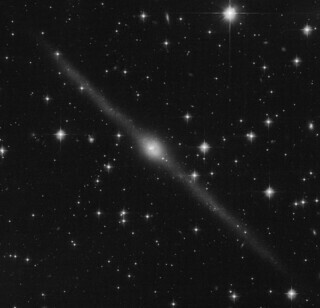 A super faint edge-on disk galaxy, and somewhat of an enigma. How it formed like this and how its frontal morphology might appear are subject to speculation, but chances are if we saw it from a sufficiently inclined vantage point, it would be practically invisible beyond its nucleus, assuming what we see is spread out fairly evenly along the disk and not concentrated along some very skinny arms. Anyway, I'm happy to simply enjoy yet another wonderful variation that nature has given us. North is 16.50° counter-clockwise from up.